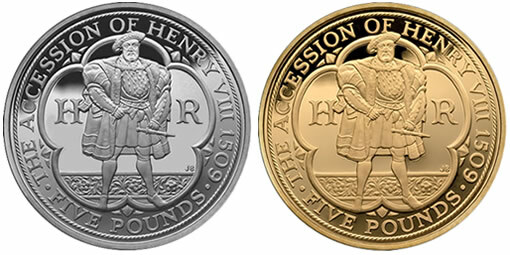 Celebrating the 500th anniversary of the ascension of a king considered to be controversial at the least, the Royal Mint has issued the 2009 UK Henry VIII £5 coins. These coins are available in platinum, gold, silver and cupro-nickel. The British Royal Mint has announced the sale of individual proof £1 gold, silver and Piedfort silver coins featuring Welsh graphic designer Matthew Dent’s rendition of the heraldic shield of the Royal Arms — only the third coin reverse version since 1983. 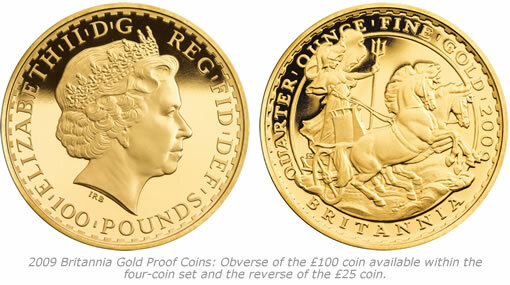 The coins have an extremely low mintage with the 22 carat gold piece limited to just 1,000 and each .925 sterling silver coin set to only 5,000. The Piedfort £1 is unique in that it’s twice the weight and double the thickness of its circulating counterpart. 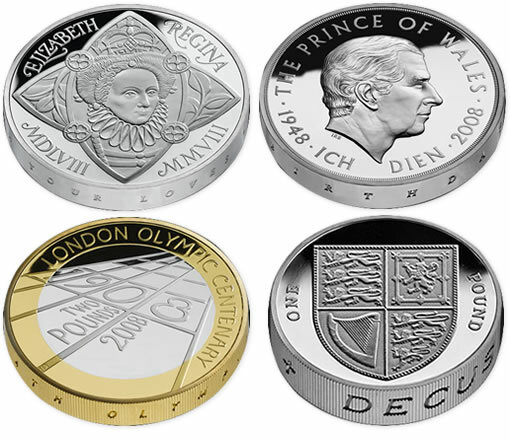 While it has the same 22.5 mm diameter as the non Piedfort silver proof, its weight is doubled at 19 grams. The British Royal Mint has announced the sale of the extremely limited 2008 UK Queen Elizabeth I £5 Piedfort Platinum Proof Coin, and only days after releasing the four-coin silver proof Piedforts. The platinum coin, like its sister silver version, has the piedfort-style double weight and thickness. It’s on sale for a whopping £5250 (~$10,264 USD). Too high? Set aside the coin’s beauty and consider only its limited 150 issuance and 3 ounce platinum content. You might just reconsider. 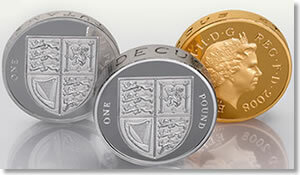 The Royal Mint launched their very limited 2008 UK Silver Proof Piedfort Four-Coin Collection for £249.95 (~$490 USD). Piedfort coins are unique with their contrasting double weight and thickness. The name ‘Piedfort’ (Pee-ay-fore) actually comes from the French word meaning "heavy measure."